I love vintage linen. (*sigh*). Closest to my heart are vintage tablecloths and napkins from the 50's and 60's. I have only to look at a apiece of such finery and my heart skips a beat. 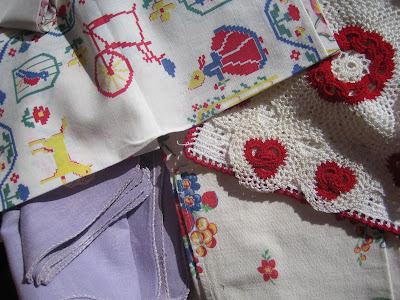 When my mother passed away last february, she left behind a treasure trove of linens. She had been saving pieces she found at antique sales for more than 5 years! I brought home with me 5 boxes of wonderful teatowels, crocheted doilies, tableclothes, napkins, and pillowcases. Of particular interest are sets of 52" square tablecloths with a matching set of four napkins. When I see these beautiful sets, I envision a lively game of bridge or bunco. If only these linens could talk, I am sure they would have much to say! Hey! I came across your blog on SITS! Congrats for being a Saucy blog. I'm a coach's wife too. Isn't it fun. My husband coaches boy's basketball and it has been such a blessing and a way for us to witness to those young men. Have a great day!